Do you need algebra help? I did, too. You mean the writer of Loving Living Math needed algebra help? Why, yes. Yes, I did. There’s nothing to be ashamed of when you run into a brick wall in a homeschooling subject! One down, two to go. My oldest (11th grade) has successfully made it through Saxon PreAlgebra , Algebra 1 and Algebra 2. I really have no problems with algebra as long as I’m doing the lessons right alongside my children. BUT, who wants to do each and every lesson right alongside their children? So…after entering Algebra I with my daughter, I found that jumping into the middle of a lesson or chapter to try to answer a question was more than I was able to do without great effort. What to do?? I could have hired a tutor or entered her into a dual credit college class – both of which would have been perfectly acceptable. I didn’t want to take such a drastic step at first. Luckily, we found the Saxon Teacher CD’s to be just the answer for her. Each lesson was presented clearly by a teacher and a complete walk-through of each and every problem was available when she got stuck. The second kid has been a little more challenging up to this point. He is really good at math, but hates it. That means he and Saxon don’t get along so well. Through product reviewing, I’ve found a couple of resources that are right up his alley and we’re finding PreAlgebra and Algebra I to be a success. This kid is all about practicality. Do his assignments make sense in his [limited] view of what he needs in the real world? When I saw the title of this Hickory Grove Press book by Ed Zaccaro, Real World Algebra, I knew I had to have it. Is it living up to it’s title? Yes! While my son isn’t magically begging for math, he is enjoying the conversational lesson style. Two characters talk to each other about how this algebra thing works and why it’s important to know. Their conversation is where the teaching for each new lesson happens. In other words, it’s way less “academic” in appearance, but still packs a big punch in teaching. In fact, I feel like we’re getting even further in solving complex problems quickly! Because Real World Algebra is set up so nicely in topical chapters, we are using each chapter as “teaching time with mom.” In other words, we go through one chapter together over several days. We read the conversations between characters together, work a few of the problems together on the white board and then he practices a few problems on his own. With the conversational style of the lessons, I’ve found Caleb “getting it” way faster than if he were reading a dry lesson. This kid thrives on relationships, so the combination of the relationship he forms with the characters of the book and the relational lessons he and I have, he is tackling much harder concepts than before with less effort. Real World Algebra moves fast. I like that we learn how to solve 6n-8=22 and pretty quickly move on to 4n-9+2n-6-7n=6n-36. You might think that’s an awfully big jump to make in just a lesson or two, but the way it’s explained makes the fast progression pretty easy. Because it moves fast (and I feel like information overload will clog up the learning pipes of my sweet son), we do a chapter or two from Real World Algebra together and then take a few weeks break to jump back into No-Nonsense Algebra for a chapter or two. No-Nonsense Algebra is a different sort of learning that requires Caleb to read short lessons and watch a teaching video. He doesn’t like this style quite as much, but it’s good for him to adapt to learning this way more! I’ve seen a huge improvement in his independent understanding since adding in Real World Algebra! 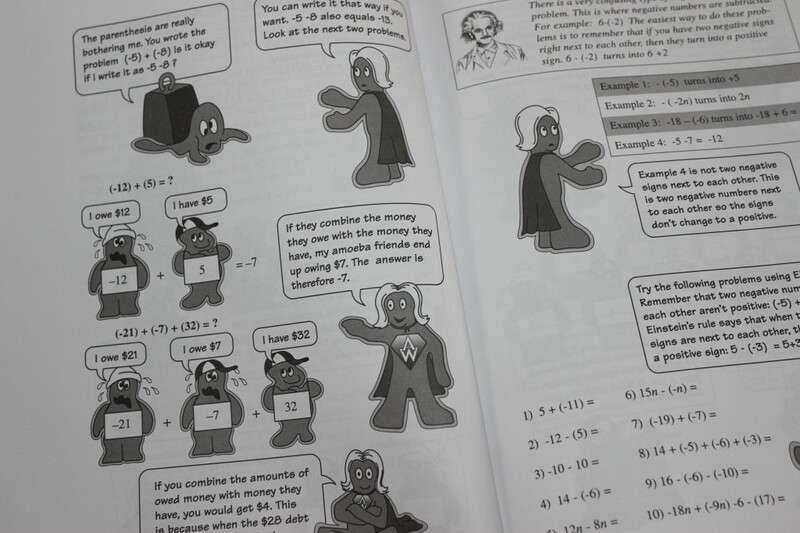 Don’t be afraid of algebra – there’s plenty of help out there! We’re using Life of Fred as our “spine” text and are in Advanced Algebra. They like LOF, but aren’t algebra fans at all. They thought it was bad when the alphabet got involved in mathmatics, but throw in imaginary numbers and they’re ready to revolt! And how do you answer that “how will I use it in real life?” question when you can’t even remember dealing with imaginary numbers in math class, let alone in the “real world.” Does Real World Algebra cover advanced algebra material? At this point I’m telling them “Once we get through this year we’ll have geometry, which you’ll find pretty easy, and then we’ll do accounting or something practical for our final math class. And we’re 1/4 of the way through this year! OH My! I can’t wait to try this! 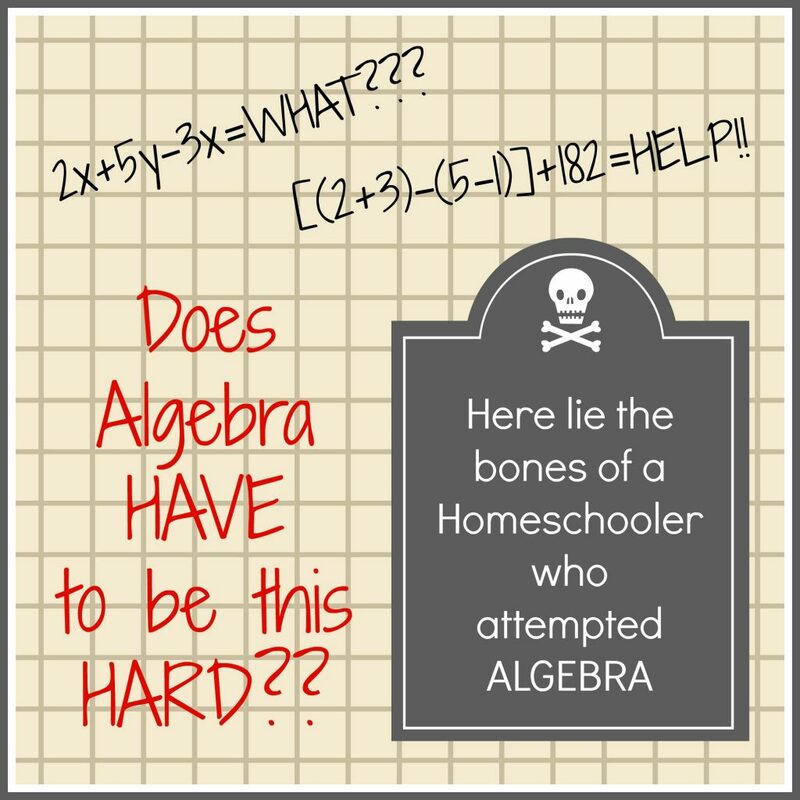 I, too, have a Caleb who hate Algebra and wonders why in the world he needs to take Algebra! He is currently taking a co-op class using Saxon so I can’t really pull him out, but I am going to order this to use with that also. He isn’t doing very well in the class either, but I think it’s more of an attitude issue than the actual inability to do it. THANK YOU!!!! I am still a little confused about Real World Algebra. Is it supposed to supplement or be a stand-alone? My two oldest have completed Saxon Algebra, but it was a big struggle to one of them. They worked independently and I neither had time to help with algebra, nor could I remember it. If I use Real World Algebra for my third student, will it be all she’ll need? Will it give as much as Saxon? 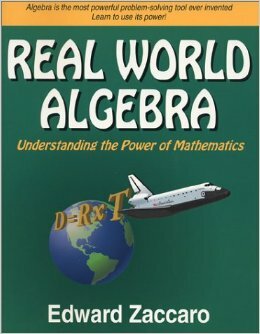 Oksana, I’m pretty sure the author believes Real World Algebra should be considered a stand-alone. We used it alongside No-Nonsense Algebra, though. I do not believe it’s nearly as rigorous as Saxon. 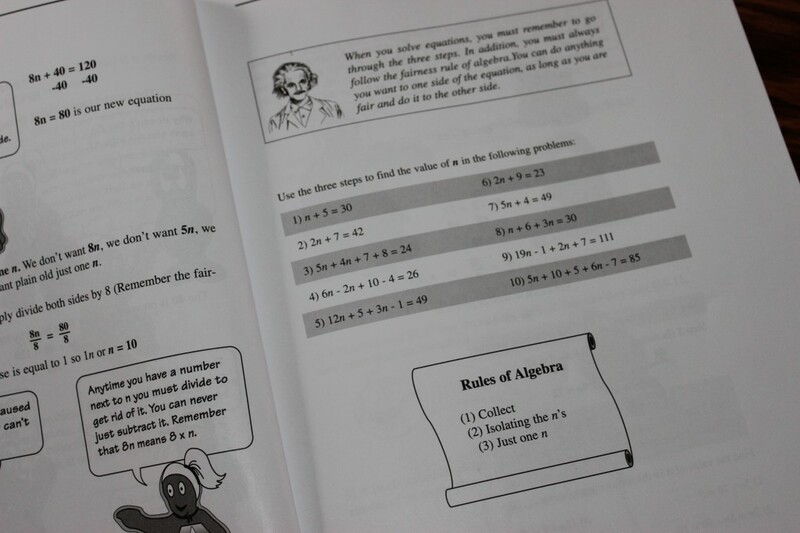 My son was easily able to transition into Teaching Textbooks Algebra 2 afterwards. However, many people don’t feel like Teaching Textbooks is as rigorous as Saxon either. My son did just fine on his ACT and he doesn’t plan to go into a math heavy program in college, so I’m not at all concerned that we didn’t go the rigorous route. Note that it will NOT be all your daughter needs for algebra. I considered it as pre-algebra into algebra 1. You will definitely still need an algebra 2 program.